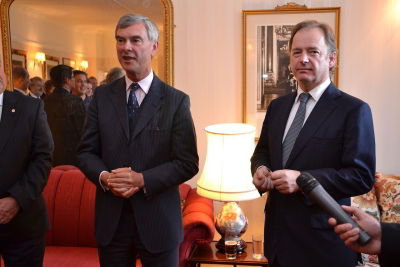 Nigel Robert Haywood CVO (born 17 March 1955) is a British diplomat, who served as British ambassador to Estonia from 2003 until 2008 and Governor of the Falkland Islands from 2010 until 2014. Haywood was born in Betchworth, Surrey, but moved to his mother’s native Cornwall when he was nine, following the death of his father. Educated at Truro School, Haywood studied English at New College, Oxford and then attended the Royal Military Academy Sandhurst before going back to Oxford to study linguistics, eventually becoming a Member of the Chartered Institute of Linguists. Haywood, a Cornish language speaker, was named Bard of the Gorsedh Kernow in 1976. After leaving Sandhurst, Haywood was a Lieutenant in the Royal Army Educational Corps before joining Her Majesty’s Diplomatic Service in 1983. He first worked in the Foreign and Commonwealth Office with postings in the Republic of Ireland, Hungary, Israel, and Lebanon. In 1992 he be became the Deputy Consul-General in Johannesburg and in 1996 he was appointed Deputy Head of the UK’s Delegation to the Organisation for Security and Co-operation in Europe in Vienna. From 2003 to 2008 Haywood was the Ambassador from the United Kingdom to Estonia, during which time he and his wife featured in the BBC series Monarchy: The Royal Family at Work which documented Queen Elizabeth II’s 2006 visit to Tallinn. In October 2006 Haywood was appointed a Commander of the Royal Victorian Order (CVO). After five years as Ambassador, Haywood became the Consul-General in Basra, Iraq. This earned him the Iraq Reconstruction Service Medal. In 2009 it was announced that Haywood had been appointed Governor of the Falkland Islands and Commissioner for South Georgia and the South Sandwich Islands; he took up office on 16 October 2010. As Governor, Haywood led commemorations for the 30th anniversary of the Falklands War in 2012 and strongly criticised Argentina’s sovereignty claim over the Falklands during increased tensions following the 30th anniversary of the war and the decision of the Falkland Islands government to start oil exploration in Falklands territorial waters. Haywood also used his position to praise the influence of the islands’ Chilean population and promote links with Chile. In late 2012 the Foreign and Commonwealth Office announced that Haywood would be leaving the Falklands in April 2014, to be replaced as Governor and Commissioner by Colin Roberts. This entry was posted in All the Nigels and tagged Politicians. Bookmark the permalink.